Signs of Spring are everywhere on Bear Creek now. 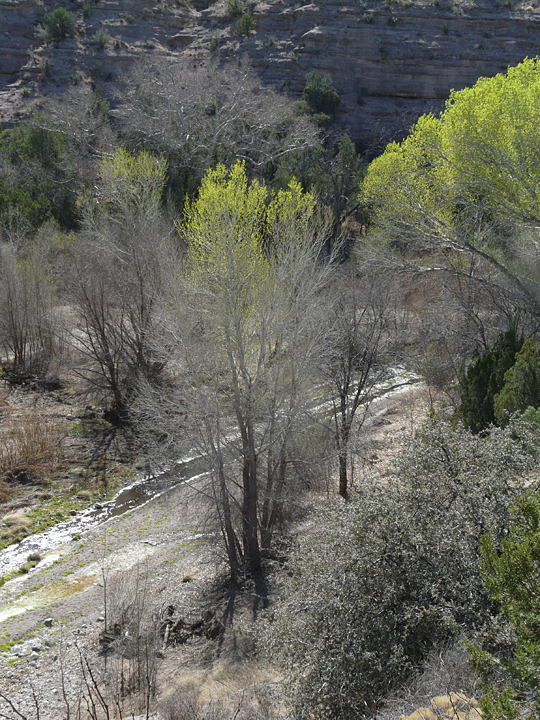 At last, our long, cold, dry La Niña Winter is over and the dormant, monotone-gray vegetation along Bear Creek is waking up. While a few late starters are still sporting furry whitish-yellow catkins, most stands of the Bluestem Willow (Salix irrorata), which grows in spotty thickets along the Creek, have progressed to putting out their first small green leaves. Shiny deep-green clumps of native grasses have also poked up here and there along the water’s edge, much to the delight of the Mule Deer and Rocky Mountain Bighorn Sheep who come down from the adjacent hills to drink and feast. 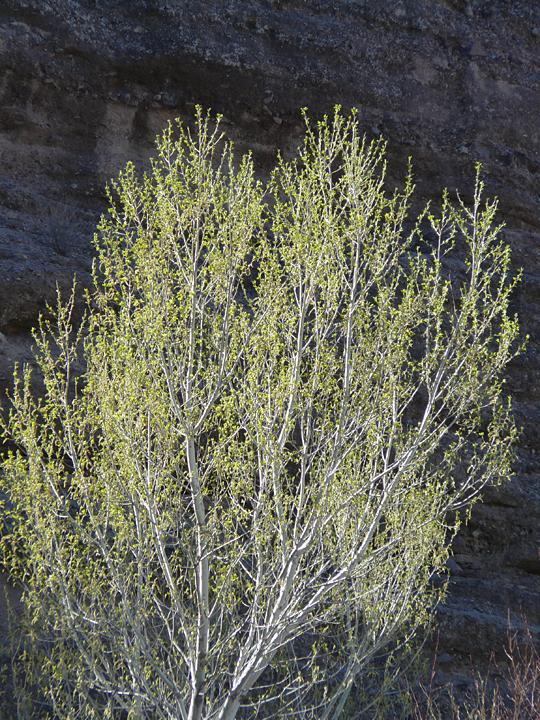 Yet as interesting and as promising as these and other first signs of Early Spring may be, it is the electric yellow-green leaves of Freemont’s Cottonwood (Populus fremontii), now lighting up in abundance throughout the Bear Creek floodplain, that command one’s attention, their borderline-garish verdant display simply impossible to ignore. Hiking along Bear Creek, one’s eye is repeatedly entrained in silent awe of these magnificent cottonwoods, as both young and ancient specimens alike stand illuminated in the brilliant, hard, early-morning light, silhouetted against the reddish-tan conglomerate cliffs rising precipitously in shadow from the floodplain across from Casitas de Gila Guesthouses. Fremont’s Cottonwood is one of several species of cottonwoods found in the US, and is the dominant species found throughout the Southwest United States, in Arizona, California, New Mexico, Nevada, Texas, and Utah. It is a large tree, attaining heights of up to 120 feet, with diameters of 5 feet or more, and a crown often spreading in excess of 100 feet. 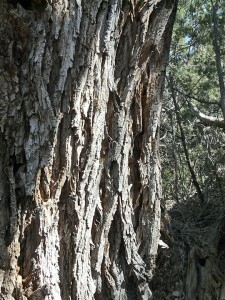 The bark, while smooth in younger trees, becomes deeply fissured as the tree matures. 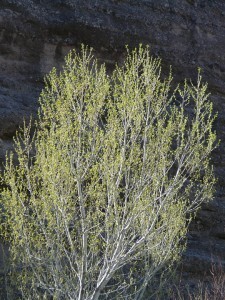 Fremont Cottonwoods are dioecious, putting out flowers from March to April in the form of a long, drooping catkin that differ between male and female trees. The fruit consists of egg-shaped capsules which split open when mature to release quantities of wind-dispersed seeds carried by tufts of cotton-like filaments, often covering the ground like snow. Leaves are heart-shaped, 2 to 3 inches long, a shiny deep green with white veins and serrated margins. In the Fall, these leaves turn a beautiful deep yellow to orange, turning the floodplain into rivers of gold when viewed from the hills and mountains above. Leaves are attached to the stems by a 1-1/2-to-3 inch long vertically-flattened petiole which produces the characteristic fluttering in the slightest of breezes. Cottonwoods are water-loving trees, with their deeper roots extending below the permanent water table. The wood is much like a living sponge, and the heavy, water-saturated branches are highly prone to breaking off in high winds. While inviting for shade and refuge, they can be deadly for campers during a storm. Normal life span is referenced as being 130 or 150 years; but in certain favorable and protected sites this could well be exceeded by many, many years. The largest known specimen recorded in the National Register of Big Trees is in Santa Cruz, Arizona, measuring 42 feet in circumference, over 13 feet in diameter, 92 feet in height, and has a spread of 108 feet. For many a pioneer wagon-train family crossing the dry, parched wilderness of the American West, their water barrels running dangerously low, the sight of that distant sinuous band of Spring green to Autumn gold cottonwoods snaking across the landscape was the tangible godsend to their prayers. They knew that cottonwoods meant water – either at the surface or shallow enough to dig. They also knew that beneath those lofty, rustling boughs awaited a welcomed cool, shady respite from the incessant, searing rays of the Western Sun. Many of these pioneers would put down their own roots along these cottonwood-lined valleys. “No need to go further”, they would say, “it looks mighty fine right here”. Some would try their hand at farming, finding out fairly quickly that cottonwoods, while not much good for firewood or fodder for their animals, made a decent fencepost. Others, with more expansive dreams, would end up ranching the adjacent hills and mountains that spread out in endless emptiness before them, quickly learning to site their homesteads on the hillsides well above the reach of the floods that would periodically rage through the ancient cottonwood groves below. In time, quite a few of them would choose a more obsessive path, that of eternally chasing the illusive golden flakes that occasionally could be found shining enticingly in the stream beds beneath those same cottonwoods in the clear, shallow waters of the deeper canyons. 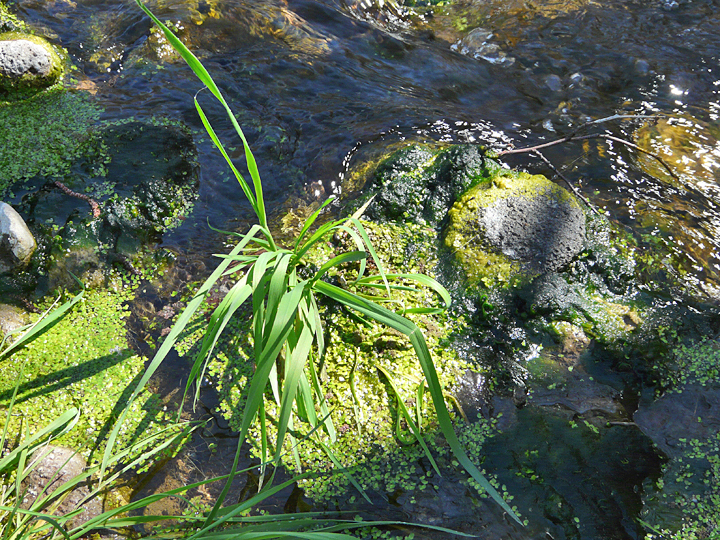 And so it was in the valley of New Mexico’s Gila River and along the more hidden meanderings of Bear Creek. All the while the cottonwoods watched in soft, rustling observance. To the Native Americans of the American West, however, the cottonwoods were much more than just a cool drink in a shady spot. For countless generations of various tribes, cottonwood trees were an integral part of daily life whose cultural uses ranged from offering a sacred connection to the Great Spirit to being Nature’s provider of everyday basics, from medicinal to edible to the utilitarian, and, sometimes, to the special. Several of these specific uses are listed below. In reviewing the uses listed below, it is highly probable that many, if not most, other Southwest tribes besides those listed used Fremont Cottonwood in most of the various ways listed, particularly in the medicinal and edible categories. Most of the trails in the Casitas de Gila Nature Preserve along the Bear Creek floodplain have extensive stands of Fremont Cottonwood. The growth of the younger cottonwoods in the central part of the floodplain since a major flood in February 2005 (8 feet above normal flow, bank to bank) is well documented in the Casita’s Self-Guided Nature Trail. 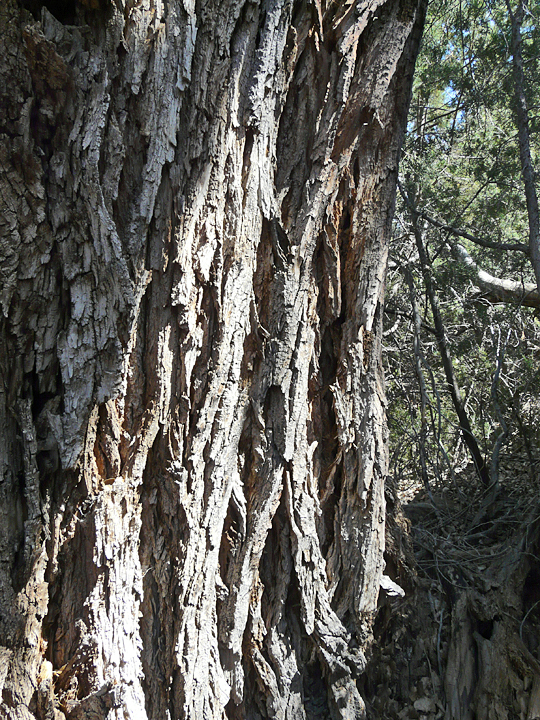 The Big Tree Trail leads past several old-growth and very large cottonwoods, including one giant specimen that measures 27 feet in circumference (8.6 feet in diameter)! 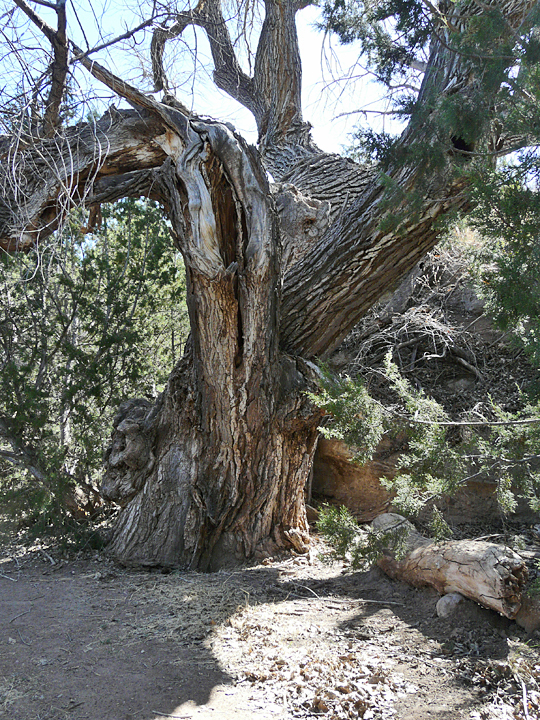 This tree is well protected from floods and high winds by vertical ledges of Gila Conglomerate that buttress its east side. Thus protected, it is thought that this tree is probably the oldest tree on the property, possibly in the neighborhood of 200 to 250 years. To pause and sit quietly on the log bench placed at its base and to contemplate and listen to the fluttering leaves rustling far above is a treat for one’s soul. Judging by the numerous tracks commonly found in the trail next to this tree, it is apparent that this is a favorite spot for other residents of Bear Creek as well. Examining these tracks over the years, we and our guests have identified a wide variety of passerby fauna, including Bobcat (Lynx rufus), Coatimundi (Nasua narica) and even the occasional Mountain Lion or Cougar (Felix concolor). 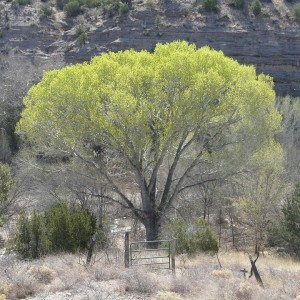 This entry was posted in Bear Creek, New Mexico trees, wildlife and tagged cottonwoods, native americans. Bookmark the permalink.